We are a leading Manufacturer of liquid copper compound from Ahmedabad, India. Packaging Size 500 ml, 1 ltr. 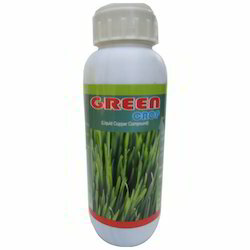 Apart from all our products we also offer Liquid Copper Compound (Green Crop) to our esteemed clients. Manufactured from high-grade ingredients these Liquid Copper Compounds are safe to use and increases the metabolism process of plants. Our products are made under the strict direction of professionals, and thus are extremely accurate in composition. Green Crop is a very important Plant Nutrient & fungicide, it increases efficiency when used with pesticide, it is a systemic type of essential nutrient & hence easily absorbed by the plant, it can be given at any time & any stage of the crop.